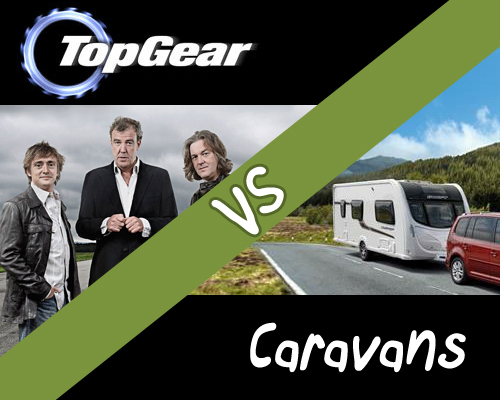 During it’s time on our TV screens, Top Gear has managed to cause caravans some serious pain. While it makes for great viewing, I was wondering to myself how many different things Top Gear have actually done to caravans. So I thought it might be fun to compile a list of them all here on the blog. I’m waiting to hear back from the BBC to get permission to edit the YouTube videos into one big compilation video. So for now you’ll have to watch the videos one at a time. James and Richard go head to head in a game of car darts with a twist… a caravan is the bullseye. Scrub to 3:18s in the video to get to the addition of the caravan. James is piloting a caravan airship (yes, you did read it right) and plans to land at a caravan site he’s booked into. But things go wrong when he accidentally enters Norwich City Airport’s restricted airspace. James is challenged to beat the current land speed record while towing a caravan of 128.86mph – see if he manages it. Watch part 2 and part 3 here. James and Richard build their own novelty train from caravans and treat railway inspector officials to a short trip down the line. Watch part 2 here. In this clip Jeremy is demonstrating how indestructible an old Toyota Hilux is, in an attempt to kill the Toyota he drops a caravan on it… Scrub to 5:18 to see the caravan drop. I’d like to say that no caravans were harmed in the filming of the above videos, but I’d be lying. Top Gear does really seem to have a passion for killing off caravans. In fact, I have an interesting post coming up soon addressed to a certain BBC TV show presenter… watch this space.